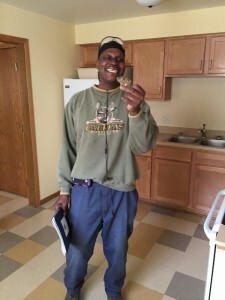 Greg came to Better Futures Minnesota homeless, wanting to build a better life for himself. Today he got the keys to his first-ever apartment. Like many men who leave prison, Greg was homeless. Greg came to Better Futures Minnesota to learn new job skills that could put him to work, and eventually lead to him to the doors of his own home. Better Futures Minnesota is designed to respond immediately to participants’ most basic needs—safe, affordable housing, access to health care, and job training and coaching that provide men with the skills they need to work. That’s because that we know that over time, the focus on employment, housing, and a seamless access to essential services breaks longstanding patterns of self-destructive behavior and violence. Dedicated to walking a new path to success. Greg worked full-time and more, getting up every day at 4:30am to ensure he didn’t miss the buses he needed catch to get to work. Today, that hard work has led him to the doors of his first apartment. Greg contributes his success to the skills he learned working at the Better Futures Minnesota ReUse Warehouse and the 16-week on-the-job training he received as part of the program. Please congratulate another participant who has worked alongside Better Futures Minnesota to create a better future for himself and his community!